Nowadays too many dogs are effectively square pegs in round holes. When I was young (years and years ago) many women didn’t work. Dogs weren’t left alone for long. There was little traffic outside the bigger towns so dogs had a lot more freedom. Few were bred for anything in particular. As I remember it, there were many more cross-breeds (mongrels). Today people choose their pedigree dog too often purely based on what the dog looks like and fashion. Many of these dogs are bred to do a job. Both men and women go out to work. What do we have? 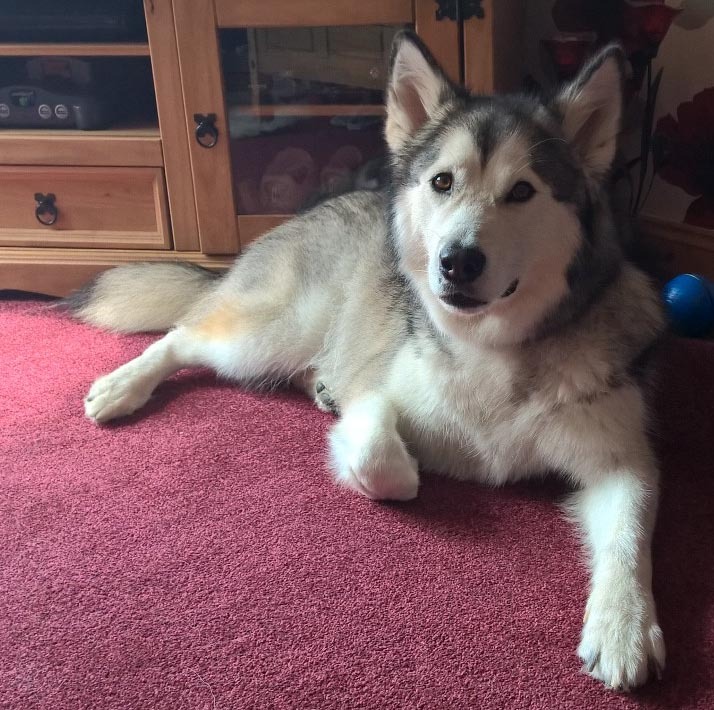 We have a dog – in this case a Malamute – who due to the couple’s change in work circumstances is now left alone for eleven hours a day. However much they try to compensate when they get home, this is simply too much time for a dog, bred to be a sociable creature, to be all by herself. Husky-type dogs are in fashion at the moment and visually you can see why. Stunning to look at. Siberian Huskies and Malamutes are bred for pulling heavy things and for endurance. 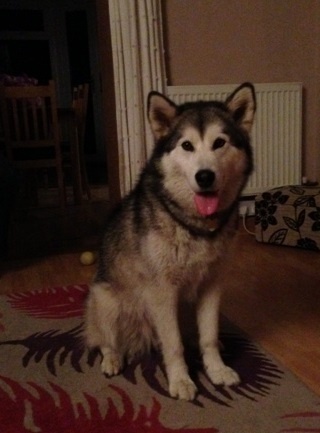 Another thing that attracts people to Malamutes is that they are noted for being friendly. So with the dog I went to yesterday we have dog that is bred for being friendly that is left alone for eleven hours a day; a dog that is bred to work with humans for hours, pulling things over many miles, taken for two lead walks a day. Two-year-old Evie is absolutely delightful. She is also like a fluffly ball of built-up frustration and excitement that bursts out from time to time. Beautiful Evie is walked for an hour at 5.30 am before work (which is testament to how they are doing their very best) and has another walk in the evening when the lady gets home. After a long and busy day, Evie’s young humans are tired. About a week ago, instead of simply being over-excited when she saw another dog on a walk, her hackles went up and she snarled at it. In quick succession this past week there have been four further incidents which were all noise and show, nothing else. 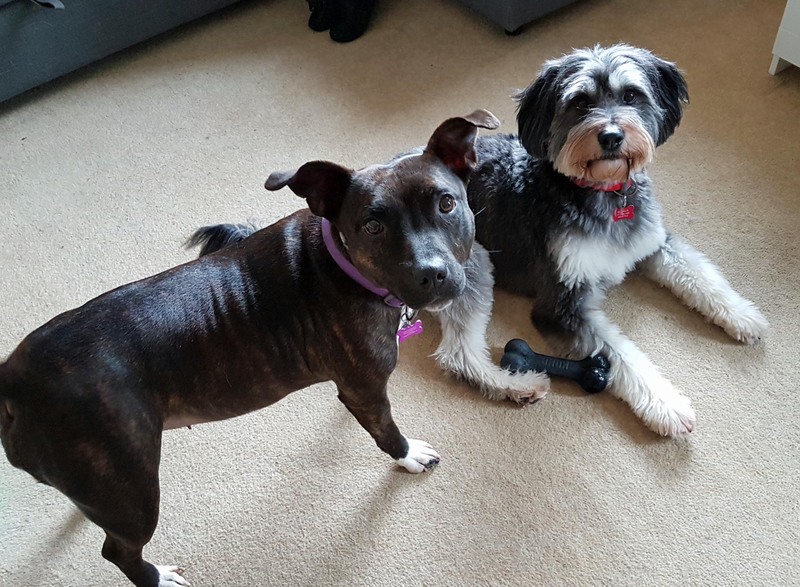 Then a couple of days ago, with terrible timing, an off-lead Staffie they met in an alleyway went for Evie. Evie retaliated and a fight ensued. The man kicked both dogs. The young lady was extremely distressed as you can imagine. To make matters worse and as is so often the way, the owner of the out-of-control off-lead dog shouted abuse at the person whose dog was on lead! 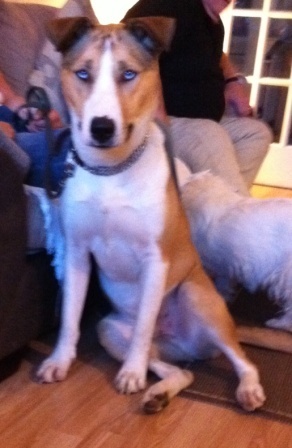 Why did Evie’s behaviour suddenly change a week ago? At my suggestion they have had her checked at the vet and she seems to be 100% healthy. The trigger may be that the young lady was particularly stressed at the time. Evie may well have picked up on her owner’s mood. They will be looking for a daily dog walker to break up the time that Evie spends alone. They now know how to work on her behaviour with other dogs. Fortunately it’s only been happening for a week so won’t be too much of a habit yet. How frustrating must a walk always on lead be, particularly on a Flexilead where there is constant tension, to a dog that has so little ‘happening’? They will now use a loose long line so she can at least feel some freedom. They will work very hard at her recall so perhaps, one day, she will be trusted off lead. 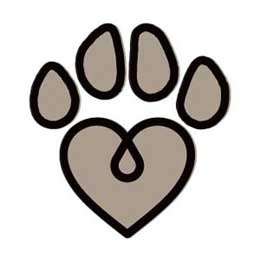 They now have a list of activities to choose from that will give Evie stimulation and a chance to unwind during the evening – things for her to chew and do – training activities including some clicker training. (The young lady who had never used a clicker before was a natural. She totally got it). Clicker will help Evie to use her good brain. A big thing they will now do their best to stop – is saying NO. I suggested a ‘swear box’, a pound every ‘No’. Poor Evie is constantly being corrected. Now they will be getting her to earn some of her food – giving it to her whenever she does something ‘good’ like watching their cat and before she starts to chase it, like when a dog comes on TV and before she begins to bark at it or if she settles. Although they will never be able to fully give Evie what she was bred for, they will be able to give her a much more fulfilling life. She will be less frustrated and have more self-control which will inevitability affect her general behaviour with other dogs. 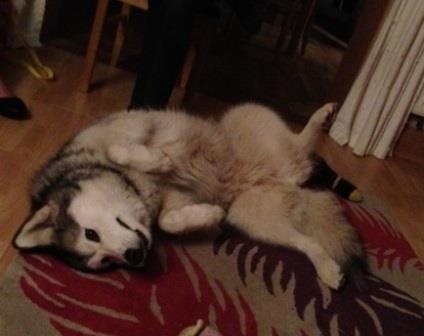 Orca is a three-year-old Husky who has been living with her new family for three months now. She is proving to be a wonderful, loving and gentle addition to the family and has helped their 8-year-old daughter to get over a previous bad experience with a dog. The gentleman freqently takes Orca to work with him at his garage where she is hooked up for safety; she is as good as gold and friendly to everyone. Out on walks however, Orca ‘doesn’t listen’ – especially when she is off lead. She has had the man waiting for two hours on several occasions. It’s not that she actually disappears but she stays out of reach! I noticed at home that everything Orca wanted she got immediately. This was the case when she pawed him and when she jumped at him. Sometimes he reprimanded her, sometimes he actually fussed her when she did these things, whilst also saying they were behaviours that they didn’t want – especially with guests and the children’s friends. Basically, every time Orca wants attention she gets it. Attention isn’t so freely available from the lady and consequently Orca pays more attention to her. You can easily understand how people adore her and want to fuss and touch her all the time. In addition to putting in some good recall training over a period of time both at home and when out, Orca needs to want to come back. As I often say, anything that is too readily on tap loses value, and this goes for an individual as well as for food. I did notice that when I ignored Orca’s jumping on me by tipping her off and then shortly afterwards I called her to me and offered her the attention under my own terms, she didn’t come. She just sat a little way away and looked at me! It illustrated my point perfectly. The sort of jumping welcome I received seemed like a mix of excitement tinged with anxiety. It sounds like this is the sort of reaction she has to meeting other dogs when out. He needs to work at getting Orca’s attention on himself when required, rather than on other dogs. By earning her respect and attention at home through being a bit more consistent and not quite a pushover, keeping her attention on him when out should be lot easier. Changing one’s own behaviour in this respect can be quite hard if it goes against ones own nature, but playing a little hard to get can work wonders at times. Until a short time ago, Rocky, a large four-year-old Ridgeback-Mastiff cross lived with his lady owner in a very small house, just one room up and one down. 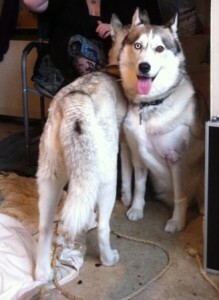 Now her friend has moved in with her two beautiful Siberian Huskies, female Dita, 2 and Male Esk, 3. Previously each lady had lived happily with her own dog/s and no particular problems. What an extremely tricky and complicated situation this is. The environment, with only two rooms and no garden, is so small and crowded for three large dogs that living closely in harmony is a real challenge. Added to that, male Esk is not good with other dogs and Rocky considers this his home and territory. He now spends most of his time in the bedroom upstairs, and the Huskies well away from him, downstairs. The ladies have to operate what they call an ‘air-lock’ system to take the dogs out which needs to be done regularly because of having no garden. There have been a couple of massive fights resulting in injury down to the bone to Esk – his shoulder and leg – you can just see some of it, and also to one of the ladies when she tried to break them up and got in the way. The wound on her arm is dreadful. None of these dogs is in any way aggressive to people. 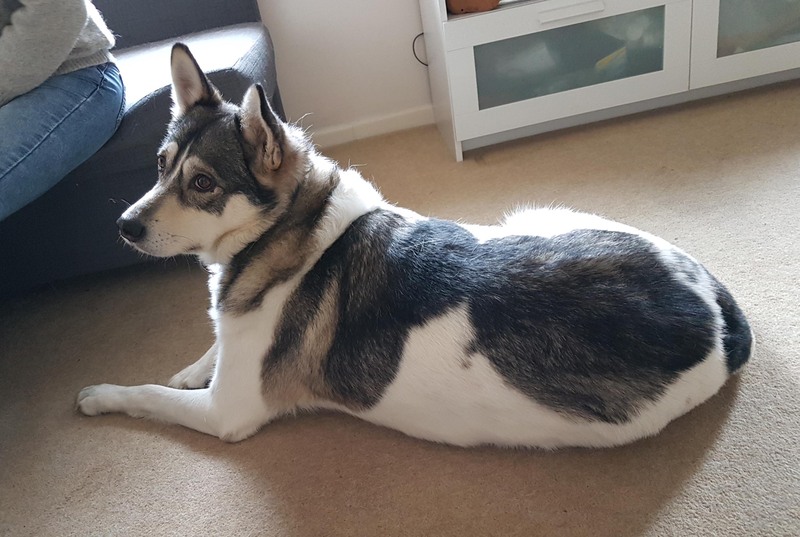 The two Huskies that we sat with downstairs were delightful with Dita showing none of her usual fears towards me, and Esk peacefully occupying the only remaining bit of floor space! Later Esk was put on lead and Rocky was brought down on lead, but with Esk eyeballing and growling across the small remaining space between them, then Rocky lunging and barking with poor Dita getting bowled over as she got in between to do her best to split things up, Rocky had to be taken back upstairs. Add to the unhelpful environment the fact the general atmosphere, due to human health problems, is not always calm and consistent. Because of their humans’ lack of strength, the two Huskies are unable to receive sufficient exercise, stimulation and toilet trips. The dogs are dearly loved and I know these two ladies will do your very best against the enormous odds, and I will do everything in my power to help them whilst also feeling somewhat overwhelmed by the unavoidable restrictions on the choices of action available. Some weeks later, a lovely message on facebook from Rocky! 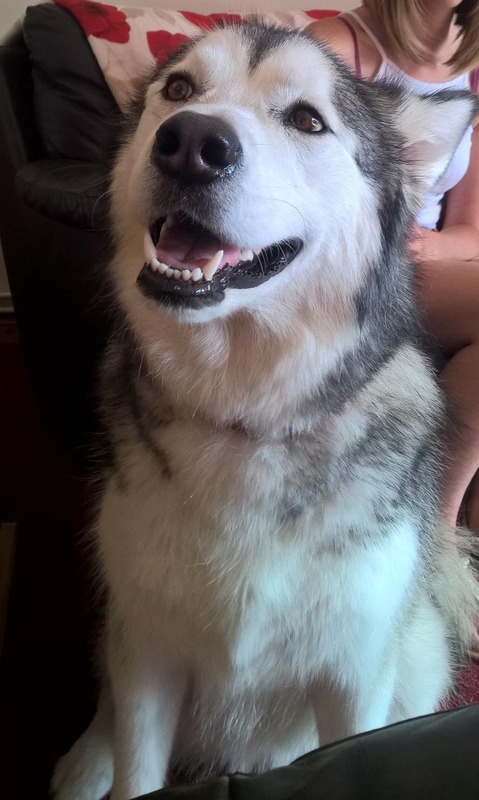 : My Mum called in The Dog Lady to help me and my Husky friends with a wide variety of issues she has proven invaluble to us we honestly don’t know how we ever coped without her. £260 for never ending help is by far the best bragain out there, the initial consultation was so thorough and friendly that if it had been any other behavourist those 5 hours would have been covered by the £260 then it would have been another £50 for every hour after that. Others still another £150 an hour since there are 3 of us dogs here! 16-month-old Rudy looks more English Bull Terrier in the photo but you can see the pale Husky eyes. A beautiful dog and quite unusual looking. Because of this he attracts attention, and human attention is what he can’t handle. Like so many of the dogs I go to, his start in life was far from ideal. From the time he left his mother and litter mates at 8 weeks old and until he was four months old, he was shut in a room all alone for hours on end, before being returned to the breeder. The most valuable weeks of his life for socialising and happily encountering many different things including lots of people, had been lost. My clients then took him on. Rudy is terrified of people coming to the house. He barks and hackles, but is also ready to run. He may empty his bladder if approached. He has never bitten. 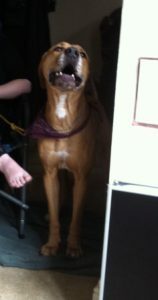 He barks constantly when anyone he doesn’t know well comes to the house – so much that nobody can speak. Unfortunately this has led to a lot of shouting which simply makes things worse. Very unusually for him, he quietened down for me very quickly and we were able to talk after a few minutes, which goes to show how, if the visitors use the right signals and body language, don’t approach or stare at him and stay seated, if his owners too keep quiet and calm, he can be helped. He is watching me in the photo, fairly calm – but that would change quickly if I were to suddenly stand up. The other major problem is that he is so dependent upon the presence of the lady in particular that for a year they have seldom gone out. The couple are almost prisoners in their home because they can neither have visitors nor go out and leave him. So we have two big problems to deal with, fear of people and fear of being left. It is going to take a long time because each must be dealt with in tiny increments, a step at a time, with a lot of patience, and definitely NO SHOUTING!